It’s hard to think of a more important source of information in the world than quality journalism. At its best, news communicates truth to power, keeps societies free and open, and leads to more informed decision-making by people and leaders. In the past decade, better technology and an open Internet have led to a revolution in how news is created, distributed, and consumed. And given Google’s mission to ensure quality information is accessible and useful everywhere, we want to help ensure that innovation in news leads to a more informed, more democratic world. That’s why we’ve created the News Lab, a new effort at Google to empower innovation at the intersection of technology and media. Our mission is to collaborate with journalists and entrepreneurs to help build the future of media. And we’re tackling this in three ways: though ensuring our tools are made available to journalists around the world (and that newsrooms know how to use them); by getting helpful Google data sets in the hands of journalists everywhere; and through programs designed to build on some of the biggest opportunities that exist in the media industry today. From Maps to YouTube to Fusion Tables to Earth to Search, we offer many tools that newsrooms can use in their reporting and storytelling. Now, journalists around the world can access tutorials on these products created specifically for newsrooms, at g.co/newslab. We’ll post short written and video tutorials and case studies that highlight best practices from top newsrooms around the world. As Google develops new products that help journalists, we’ll update these resources regularly. You can also get updates by following us on Twitter and Google+, and by subscribing to our YouTube channel. There’s a revolution in data journalism happening in newsrooms today, as more data sets and more tools for analysis are allowing journalists to create insights that were never before possible. To help journalists use our data to offer a unique window to the world, last week we announced an update to our Google Trends platform. The new Google Trends provides journalists with deeper, broader, and real-time data, and incorporates feedback we collected from newsrooms and data journalists around the world. 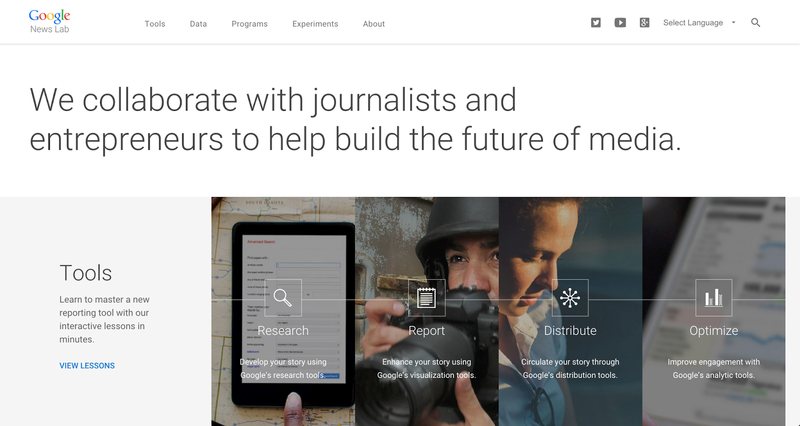 We’re also helping newsrooms around the world tell stories using data, with a daily feed of curated Google Trends based on the headlines of the day, and through partnershipswithnewsrooms on specific data experiments. We’re also working with partners to build a series of programs focused on imagining the future of news and information, as well as on empowering new voices in media. One of the opportunities we’re focused on is increasing the number of media startups in the marketplace. We’ve launched partnerships with Matter, a media accelerator in San Francisco, and Hacks/Hackers, a global community group for developers and journalists, to provide financial support and mentorship from Google engineers that will help these organizations expand their impact to more startups around the world. We’re also holding a series of TechRaking summits with the Center for Investigative Reporting: hackathons focused on developing new investigative tools such as drones, online databases, and more. Another area we’ve focused our programs on is citizen reporting. Now that mobile technology allows anyone to be a reporter, we want to do our part to ensure that user-generated news content is a positive and game-changing force in media. We’re doing that with three projects—First Draft, the WITNESS Media Lab, and the YouTube Newswire—each of which aims to make YouTube and other open platforms more useful places for first-hand news content from citizen reporters around the world. The News Lab is a global effort, with teams in the U.S., U.K., France, and Germany to start—and we’re also powering the training and research arm of Google’s Digital News Initiative in Europe. Google has created many technologies and platforms that have engaged the media industry. As both the media landscape and technology continue to evolve, we believe we can create a more informed world if technologists and journalists work together—and we’re excited to be part of the effort.